There is silence. Martha's fingernails are tapping frantically on the pod window. The Doctor is mouthing , 'I'll save you' through the airlock window as the distance between them elongates. The shots keep frantically intercutting between his agonising observation and Martha's face at the window of the pod as it slowly pulls away and falls into the sun. If '42' is remembered for one sequence then it should be for that moment as 'proper companion' Martha is separated from the Doctor in a literal baptism of fire. This is real jeopardy and the sort that mere 'passengers' in the TARDIS manage to avoid (most of the time) and for Martha it's a real sense of the death drive that propels the Doctor through his travels in time and space. It's a masterful example of performance, direction, editing and production design all fusing into one moment that sums up the heart of the series. A very Graeme Harper moment, too. Although I'd felt Chris Chibnall's work on 'Torchwood' suffered from adolescent over-indulgence, here he kept it simple, linear and provocative for all the right reasons. The 'real-time' element was a good idea and something new to bring to the series but it lacked the necessary hook to make it a special element. Where '24' indulges in split screens and clocks on screen to remind you of the format, '42' did it backwards, with a countdown , but more as an after thought, without split screen gimmicks. I'd have liked more to have been made of this idea. It didn't matter because Graeme Harper kept the pace rolling along, with no pauses for breath, sharp camera moves and deep focus all adding to the feeling that this was the ultimate in Doctor Who 'running down corridors' episodes. And Harper loves his primary colours, doesn't he! Bold reds, yellows, blues in the lighting and set design all helped make this one very rich visually, especially combined with the steam, smoke, flares of light and reflections liberally applied therein. Oh, and any similarities to 'Solaris' and 'Sunshine' , the dirty futures of 'Alien' and 'Blade Runner' are fine by me and likewise the nod to Sorenson's transformation in the classic series' 'Planet Of Evil' and the S.S. Pentallion referencing a certain 'drive' in 'Revenge Of The Cybermen'. And Ashton's possession by Korwin , head wreathed in smoke was surely an homage to 'Pyramids Of Mars'. I like my references. The idea of a sentient world is a pulp SF trope that's been knocking around for a while and everyone from Arthur C. Clarke to 'Blake's 7' have been in on the act. For me, the sentient sun is a symbol full of contradictions. Not only is it a manifestation of the godhead, a form of celestial epiphany for the Doctor and Martha when they look upon it, but the rising and setting of the sun is a journey into and out of the darkness, guiding souls through the darkness whilst also burning and killing at a glance. Both the Doctor and Korwin are fried and frozen, possessed with burning knowledge and then forced to drop below the horizon like a setting sun. The sun-filter masks are also linked into the destructive power of the sun. The masks worn by the possessed are an external aspect of the vengeful ego and trap and control the vast forces that can be unleashed from the sub-conscious. The Doctor, Korwin and Ashton are symbolic prisoner and captor, representing two interchanging forces in one body. The episode is also another voyage into the realm of the feminine principle with both McDonnell and Martha as pivotal to the resolution of the crisis. Martha is Dante's Beatrice, guiding the Doctor through Purgatory and McDonnell is the agent of sacrifice through love. Both women become what Plato describes as 'the universal author of all things beautiful and right, parent of light and of the lord of light in this visible world, and the immediate source of reason and truth in the intellectual' in that they find the innate goodness within themselves despite past mistakes ? Martha's dispute with her mum, McDonnell's failure to identify the sentient nature of the sun. And talking of Martha's mum Francine, I'm pleased to see that the seeds sown in 'The Lazarus Experiment' have started to grow with her now being drawn into the web of intrigue that surrounds the mysterious Harold Saxon. These scenes, together with the mobile phone upgrade, nicely echoed Rose's conversation with Jackie in 'End Of The World' but they've taken that idea and added the dark twist of Saxon's interest in Martha and the Doctor. Oh, Francine, what have you done! 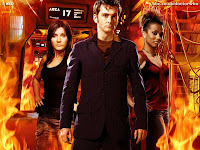 A good, solid episode with some outstanding work from Freema Agyeman, especially her scenes with William Ash as Riley, and David Tennant really on form again and showing us a vulnerable, frightened Doctor for a change; excellent, pacy direction from Harper and handsome production design from Ed Thomas and his team that shifts the series into its next gear and aims us towards what looks to be a gripping finale.